The first pages of this online booklet will describe why creating these new eco-communities is so urgent. The remaining pages of this online booklet will describe all of the vision, policy, values, structural and procedural details of how these new eco-communities should come into being and function. Please bear with the first pages of this booklet. They deal with some very unsettling facts about the escalating global warming emergency as well as the other major global challenges that we all now face. Why A New Intentional Eco-community Model is Needed for the Challenges of Today's World? Anyone of the above current major regional, national and global challenges by themselves is capable of creating local, regional, national or global crisis and emergency and is good enough reason to be prepared! Additionally, our older less evolved tools, systems and structures are simply no longer working either as a whole or at the regional level for humanity or the planet to cope with these escalating challenges adequately either by themselves or worse yet, if they converge together. Consequently, the well-being and survival of humanity itself is in authentic peril. We need to begin applying new more effective structures, systems and tools now! 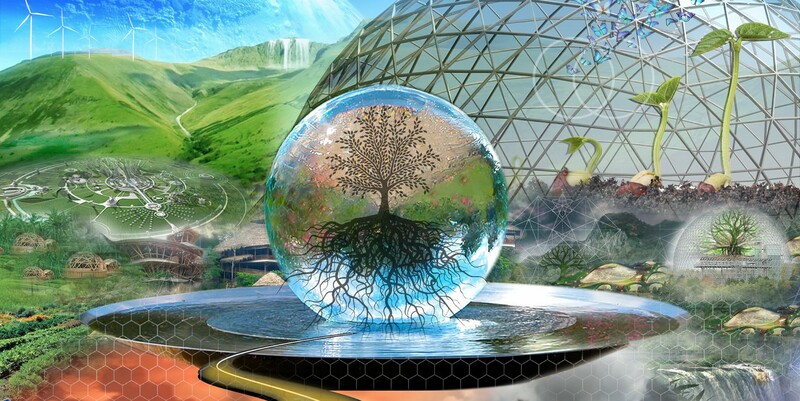 Within the Universe community, we view the new Universe Evolutionary Worldview as our best science-grounded system, structure, tool and new model. This new worldview will help us make the life-critical systemic and structural improvements or the other re-alignments in our lives and livelihoods that are urgently needed. e.) the creation of a satisfying and sustainable prosperity and the truth we are all living in an interconnected and interdependent union whether we know it or not. And finally, if you do not feel some level of agreement with the facts and perspectives or feel some intuitive congruence with the high urgency for building these new Universe eco-communities, please continue onto the later pages of this online booklet. There are many other important reasons for building these new Universe communities at this time besides preparing for possible global or regional emergencies. Please keep reading as there is a lot more to learn about these new eco-communities. The links below or to the left and right on subsequent pages will take you to the rest of the Universe Community online booklet. The pages of this booklet contain important information on climate destabilization and then all of the details and benefits about the Universe Community, how it works, how to join etc. There are 10 pages in this booklet. Universe Communities can be completely secular, both secular and spiritual or, completely spiritual depending upon the choices and individual making up that particular local Universe communities. This new vision for conscious and intentional community is applicable most specifically to those individuals who sometimes describe themselves by the newer terms of Evolutioneers or Universe Citizens. They also often call themselves by names such as social activists, futurists, Collaborative Commons advocates, change agents, Millenials, progressives, open society advocates, Preppers and eco-preppers, Internet and culture advocates, planetary citizens, cultural and economic entrepreneurs, Third Industrial Revolution advocates, cultural creatives, innovators, education and social pioneers, evolutionists, evolutionaries, sustainability advocates, co-operative advocates, planetary citizens, scientists, environmentalists, cosmists, evolutionary transhumanists, artists, hipsters, spiritual progressives, eco-spirituality advocates, agnostics, atheists, humanists or members of the Integral, Evolver, Wayseer or Maker movements. Individuals who adopt the Universe Evolutionary Worldview and the meta-principles of Evolution 2.0 in the new Universe Communities are often individuals who are concerned not only about their own personal daily success, but also about how current global economic, political, social and ecological stresses challenging their own as well as their children's hopes for a better life and a safer future. In the following Universe Community integral overview you will find the core evolutionary principles, values and structure of this new vision as well as the rights and responsibilities of members of the Universe Community as well as the community itself toward the individual. In true evolutionary fashion all of the following information about the Universe Communities vision represents an evolving work-in-process. It is not complete or final vision or structure just as evolution itself is not complete and every changing. This Universe community information starter kit is meant to be experimented with and wisely adapted as needed for optimal use in the diverse local conditions and social, economic and political environments found around the planet. Check out the three most simple basics of being a Universe community member by clicking here. Every intentional community has some founding vision and set of values and is based on some stated or unstated view of the condition or needs of the world (this is called a worldview,) as it is in their moment in time. In the Universe Communities our core and overall vision is based on the new Universe Evolutionary Worldview. 4.) be appropriately prepared for any large-scale global or regional adaptive challenge and crisis such as climate destabilization, large-scale resource depletion, economic instabilities, wars, pandemics, etc. 5.) be a "beacon of light" of a successfully community model for the new values, behavioral and structural changes that are most needed to create a sustainable prosperity future for all. We see the current world and its many adaptive challenges and possibilities primarily with and from evolutionary hope and practical realism. We also see the current difficult situation in the world as a transformational evolutionary adventure! The practical evolutionary hope for how the needed solutions for the future can most optimally unfold is conditioned for us by the new Universe Evolutionary Worldview. This new evolutionary worldview is a breakthrough multidisciplinary scientific understanding of the universe as a single inter-connected and inter-independent union as well as a complex, adaptive physical and biological system. From the new Universe Evolutionary Worldview and its Evolution 2.0 meta-principles one discovers oneself becoming a completely new type of larger and more fundamental citizen, partner with evolution and activist. We call this being an informed and effective Evolutioneer, Planetary Citizen and Universe Citizen aligning with and contributing to the planet's and universe's progressive evolution. 3.) prepared, thriving and meaning-filled individual and collective lives and joy-rich communities all of which are intentionally designed to grow in ways that also align with, forward and contribute to the progressive evolution of life on the planet and in the universe. Creating your own self-organizing universe community also requires smart leaders and finances. To put together your community’s finances you can self fund. You can create a membership monthly fee, or even a new member initial payment in conjunction with monthly fees. You can also establish your eco-community as a nonprofit organization of some type. If you establish it as a nonprofit, people who donate get a tax benefit in many countries. You can even create your eco-community as a nonprofit new religious group, church, temple, mosque, monastery or any other kind of sacred religious center that fits best and that is what you want to achieve. In some countries, being a religious organization provides many legal and financial benefits. You also can use fundraising websites like Kickstarter to raise funds. Alternatively, you could create your community as a non profit foundation or trust and again allow people to help fund it by donation. One of you may also be sharp enough legally to create an investment opportunity for building your community with shares for participating members based on their financial or other contributions to the community. It's totally up to you to create the funding model that will get your self-organizing eco-community established in the best possible way for it to become sustainable and viable.